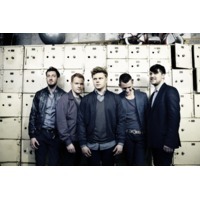 Morning Parade are a five-piece alternative rock band from Harlow, Essex, who formed in 2007 before signing to Parlophone in 2010. Their self-titled debut album was released early in 2012. The line-up comprises Steve Sparrow (lead vocals, piano and guitar), Phil Titus (bass), Chad Thomas (guitar), Ben Giddings (piano/synths) and Andrew Hayes (drums). Steve Sparrow and Phil Titus met at school and later worked together as labourers. They met Chad Thomas at college and all three became part of a band called Anotherstory., who all met at college between 2000 and 2004. Sparrow was the lead vocalist and also played the piano and guitar, Titus was the bassist and backing vocalist and Thomas played the guitar and piano. The other two members were Mike Pope, who played guitar, and Charles Gadsdon the drummer. Gadsdon now owns management firm QE, looking after acts including Feldberg, Mammut, Carlis, Keith Canisius and David Harks. Anotherstory played experimental and alternative rock, inspired by artists such as Elbow, Radiohead and The Stills. Their first single was "Traffic", prior to their break-up in 2007. After the split, Sparrow toured the local scene of Harlow and Bishop's Stortford. Footage of him playing acoustic versions of his songs from this period are still available on YouTube. During this time, he met Andy Hayes and Ben Giddings, who became the final two members of Morning Parade that same year. They had all previously been in other bands and started out away from the public eye, instead focusing on songwriting. When they did eventually start playing gigs, it took fewer than 20 before they were approached by a record label. The band ignored these early approaches, but eventually signed to Parlophone, a major British label which looks after acts such as Coldplay and Kylie Minogue, in May 2010. Their name stems from the days when Titus was working as a plasterer and Sparrow was his labourer. It used to require early mornings and travelling to get to their various jobs. They referred to this as doing the 'morning parade'. They also say the name refers to the transition period between night and day. On 29 November 2010, Morning Parade announced their 2011 UK tour. After having played a number of shows throughout the UK, they then toured Europe with The Wombats, which included performances in the Netherlands, Germany and Spain. Among the festivals played is the V Festival in Chelmsford, a few miles away from the bands hometown of Harlow. A planned performance at the Belgian Pukkelpop festival in August 2011 was canceled after the venue was hit by an unusually heavy storm, which collapsed trees, tents and stages, killing several people. "Under the Stars" was played on Zane Lowe's show on BBC Radio One, and released on 29 November 2010. It was also featured on The Vampire Diaries. The band released the video for "Under the Stars" on 2 December 2010 on YouTube, which was first shown exclusively on The Sun's website on 30 November. The song has been played on Radio 1, BBC 6 Music, XFM, Absolute Radio and Q Radio. They have also received praise from MTV, and Vogue.